After my last three oil changes and the service tech kept telling me that my oil is not on the stick. I did not believe that this was a problem with my Honda until I closely check every week on the oil and sure enough, I am losing oil. First vehicle ever own to do this. Bought a 2010 Accord V6 in 2011 (5 months old!) and it has consumed oil since new. You have to keep an eye on your oil level as you can (and will) run out of oil. Took it to Honda multiple times, was told that it didn't burn "enough" oil to become a problem. Now the car has about 130,000km on it and runs terribly. The engine doesn't idle well, doesn't start well, and still burns through oil. You will run out of oil before the oil indicator states a change is due. The entire engine/car vibrates badly when the "eco" function is active. It feels like one of your wheels is unbalanced, but when the "eco" function turns off it drives smoothly. We are just driving the car into the ground and will walk away. Not worth a new engine and the local dealership doesn't acknowledge this oil consumption as a problem. Engines shouldn't burn oil under normal operating conditions. The rest of the car has been great. Lots of squeaks and rattles, but nothing breaks. All 6 spark plugs were found extreme dirty. Repair shop told me there was a recall for the oil consumption issue. The problem (excessive engine vibration and Check Engine turned ON, VSA ON) came before we were about to enter a mountain area. Luckily we could pull it over and found some help, or it would be a disaster if entering mountain area where would be difficult to find help. I just believe that Honda is better than this, many many people feel the same way. I'd like to see them make it right. The body is in great shape but putting oil in a car regularly is such a pain. I found my engine oil to be completely out with only a one time brief flash of the indicator light. My oil life was still reflecting 40% on my dashboard. I took my car to a Honda dealership who advised me of the recall on 2008-2012 Honda vehicles. They started an oil consumption test at 118,778 miles ( oil change ) that I had paid out of pocket for and expected to bring back 1,000 miles later or if the oil ran low first. The pics I've attached shows my oil level low three weeks later. I returned back to the dealership and was told my oil was fine and to bring back again in another 1,000 miles. I'm now getting aggravated and feel like Honda is trying to get of repairing the $3,000 job. The recall warranty is 8 years or 125,000 miles. I brought my car back to Honda at 119,746 and requested to return at 120,683. As you see my time is running out and this is exactly what Honda wants it to do. I purchased Honda due to it being a reputable brand/company, but after this experience I will never purchase another one again. Honda lost the lawsuit and is ordered to fix this problem but is trying to give me the run around and will not fix the car correctly. I had an oil change on 2/28/18, and my engine was "bone" dry on 3/29/18. While driving home on the evening of 3/28/18, I noticed that the oil light flickered once, but did not remain on. Therefore, I continued to drive home (about 5-8 miles). The following morning (3/29/18), I checked my oil, and noticed there was no oil residue on the oil stick. I decided to drive my car about 2 miles to the shop, and was told that the engine was "eating up" my oil. I was also given a Honda Service Bulletin print out, which was dated 3/31/17 regarding a warranty extension about sticking rings resulting in high engine oil, which referenced my type and year of car. However, the coverage was 8 years from original purchase of car, or 125,000 miles, whichever came first. I am LIVID because my mileage is 21,000 miles over the warranty's mileage. I had ABSOLUTELY no idea that my engine even had an issue, and don't know how to proceed. If I had received some type of recall information as I did for the airbag, I would have had my engine replaced immediately while it was under warranty. I do not have money to replace my engine. Any type of helpful/positive feedback is welcomed. DO NOT BUY A HONDA !!! My Accord started experiencing excessive oil consumption as covered by the Class Action Lawsuit that Honda lost. I had a fresh oil change done by a local mechanic and then brought the car to a local Honda dealership for diagnosis and service. They insisted that they must do an oil change first, and then they would check the oil level after I drove 1000 miles. I checked the oil after 300 miles and found that I had at least 2 QUARTS TOO MUCH OIL! WOW!! A Honda dealership tried to dupe me by grossly overfilling the oil, so it wouldn't seem low after I drive 1000 miles! Furthermore, even if this is fixed, how much is my car worth after this repair is done? Would you want to buy this car? I loved Honda! NOT ANY MORE! They are yet another crooked, dishonest company! DO NOT BUY A HONDA!!!!!! My 2010 Honda Accord is burning 1 quart of oil every 1000 miles. Since this model had 7000 miles per oil change, the warning light came on when there is no oil on the dipstick. The first time I brought it in I thought that they failed to put enough oil in during my last oil change. .
Then it happened again. I then checked online and see it is a common problem for both 4 and 6 cylinder Accords. I also saw that the was a class action lawsuit filed and Honda settled by agreeing to repair the engine by replacing the rings. I brought it in to the dealer for the oil consumption test and yes, they collected evidence on the excessive consumption. They told me V6s were not covered and I have to call corporate. That's my next step. I also see there version of a fix is to change the computer to require an oil change every 3000 miles. That's great, hide the problem! I have 3 other Hondas and they don't do this. Honda is trying to say this is normal, but they are just avoiding standing behind their faulty product and avoiding the expense of fixing. This isn't 1950 technology where you add a quart of oil a month. This is supposed to be a quality 2010 vehicle. I have always been a dedicated Honda customer but if they don't stand behind their product, then no more. Toyotas don't have this issue. My Honda burns a quart of oil every 800-1000 miles. The oil light must not work because I almost ran it dry between my 3000 oil change and no indicator came on. not sure if the engine was damaged. It only has 90,000 miles. This problem first occurred on 7/13/17. I change the oil every 5,000 (synthetic), The check engine light came on around 4800 miles since the previous oil change. The oil level was very low. On 12/21/17, the check engine light came on with less than 4000 since the previous oil change. In both cases the oil was very low. This problem seems to be getting worse with each oil change. I recently found out that this is a known with problem with V6 Hondas. Major oil consumption problem. Honda has class action suit. Just opened complaint with Honda. This engine is defective. Need them to replace engine. I bought this 2010 Honda Accord EX V6 used in March of 2015. I have always used synthetic oil in this vehicle. The problem began two oil changes ago. I always have the oil changed at 5,000 miles. The first occurrence was on 12/13/16. The engine oil was very low when the routine oil change was performed. The check engine light went on again on 12/21/17. I brought to my regular auto service center (North Providence Tire & Auto). It had only been 4,000 miles since the last oil change. The oil was changed again on this date. The frequency of oil loss is getting shorter and this is why I am filing this complaint. This is second time that I have a problem with spark plug fowling due to the excessive oil consumption. The engine uses excessive oil with no indication of any leakage at all. After I researched the issue on line I found that is was a major problem for a lot of Honda owners and that there had been a Class Action Lawsuit filed which included about 1,593,755 vehicles with the same problem. Honda issued Technical Service Bulletin (TSB # 11-033) in july of 2001 but still denied the problem was their fault. The class action suit appears to have been settled quietly by Honda in October 2012. I'm looking for recourse to get reimbursed for the spark plug replacements and consideration under the class action lawsuit. Not a very happy Honda owner anymore. Update from Jan 4, 2018: Dealer replaced the short block due damage in one cylinder, along with the spark plugs. Reworked engine appears to be performing normal. Have had it back for about two weeks. I've had other Honda automobiles. None have ever used oil and I had over 250,000 miles on an '84 CRX before trading. Current car uses 2+ quarts every 4-5000 miles and there is no leak, just consumption - black exhaust pipes. I do not notice smoke but there must be some. Have just reported problem to Grainger Honda, Savannah, GA while having the air bag recall accomplished and having the HVAC control motors replaced. Grainger suggested running an oil consumption test which I agreed to have done. The engine oil has been changed and Grainger will check the consumption at 1000 mile intervals. Until I went on-line to check the consumption issue I was unaware that it was a big problem with the newer Honda cars. I bought this car in September 2009 brand new, drove for 7 years without any trouble except recently for the last couple of months it started taking too much oil. I had to top up every 1500 KM. Richmond Hill Honda advised that this is a manufacturer defect and they replaced the pistons. But also advised that i should replace Timing Chain, 4 gears and VTC actuator. I agreed and spent almost CAD $1500.00 extra along with warranty replacement. Got these fixed in 4 days and so far this went good. But awful things happened after that. I drove for on a week - when i heard loud grinding noise (like metal rod hitting the container). I Had to tow my car to the dealership and they said that the Crank Shaft bearing was broken and I have to pay for it - while at the time of replacement, they did not give any warning - charged me for another CAD $700.00. Now today they called back and that even after replacing the bearings, its making the same noise - because the Crank Shaft is shot!!!! they will have to machine the Crank Shaft (charged me another CAD$250.00) - not replace, because the replacement won't be covered by Honda Motors. And these all happened because of oil starvation i.e. excessive burn of oil. Which is originally a manufacturer defect. I really don't know what else they will charge me for. I am really concerned of the quality or parts and service here. This would be the last Honda vehicle in my life!!!! The car sputtered and the engine light came on. Took car to Goodyear who indicated it was down 2 quarts in a month, and they could not find any leaks. Checked Car Complaints and noticed a service bulletin issued by Honda. Took car to dealer who ran a diagnostic and also could not find a leak. We requested they do the software update as the car was identified as not having had it performed. They wanted to do the oil consumption test first. We were not comfortable with that because our daughter drives the car. So we asked if they would replace the engine if it runs out of oil? Software update completed. Still doing the consumption test to see if the update 'fixed' the problem. If not, it may be a 'ring' issue. Stay tuned! Update from Jan 11, 2018: OK, since the software update (which the dealer did for free), there has been no 'excessive' oil consumption. It appears that was the 'fix'. 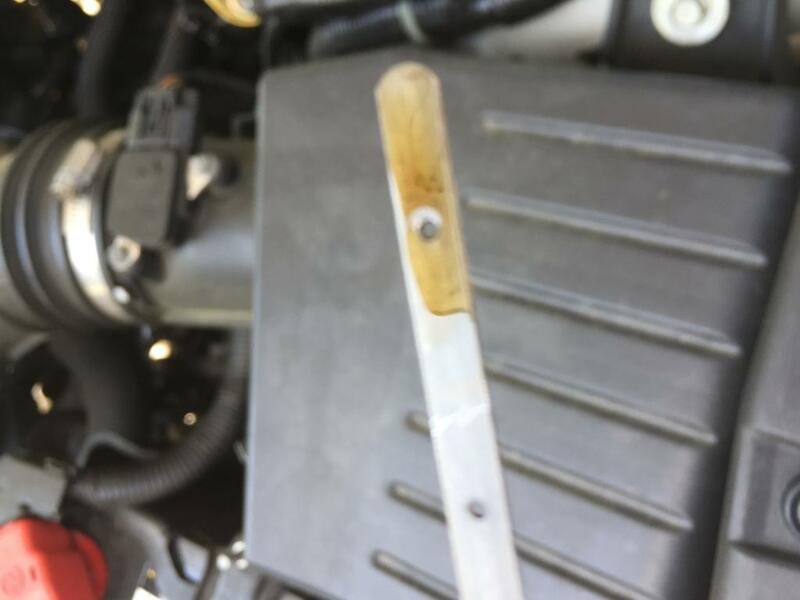 In 2016 I got a grinding noise from the engine a couple of times and found out that dipstick didn't show any oil. I took it to dealership when the service was due and they told me that oil was low and started the oil consumption check. I had to visit the dealership every 1000 miles to show how much oil is consumed and every time I was told that 1/2 quart consumption is okay and they used to refill it without a charge. They completed the oil consumption check in June 2017. 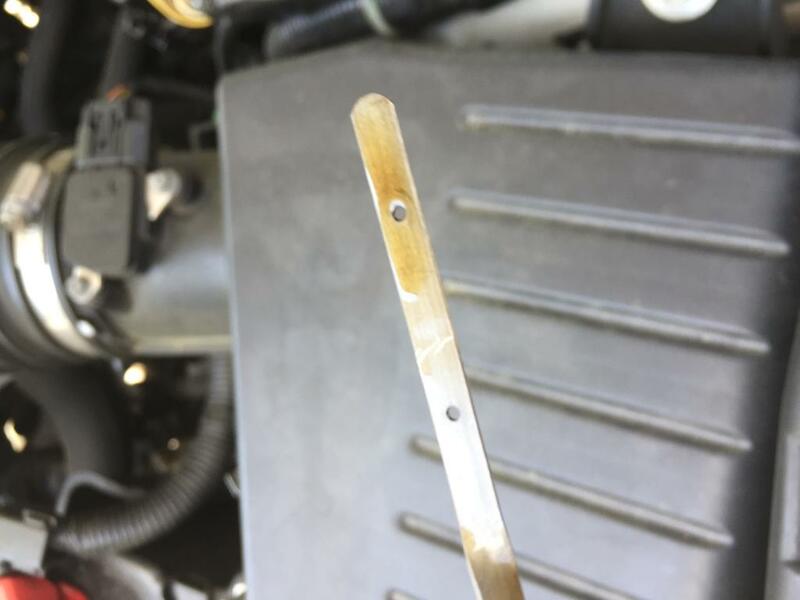 On 10/22/2017 at 50% oil level on my dashboard, I checked my dipstick and found out barely a peck of oil at the end of dipstick and the level was way below the lowest dot marked on the dipstick. I took it to dealership and called Honda but nothing happened. I paid for the oil to be added and waiting for resolution from Honda. My 2010 Honda accord is burning oil. The oil will be so low that it does not register when tested using the dipstick after about 1200 miles. Yet, no light turns on to indicate an issue. The car begins to make a grinding noise when the oil is low. I've been advised to use high mileage oil and to get my oil changed every 3000 miles instead of the recommended 5000. I have taken these actions without resolution.